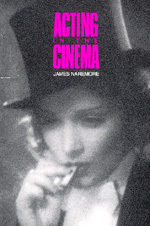 In this richly detailed study, James Naremore focuses on the work of film acting, showing what players contribute to movies. Ranging from the earliest short subjects of Charles Chaplin to the contemporary features of Robert DeNiro, he develops a useful means of analyzing performance in the age of mechanical reproduction; at the same time, he reveals the ideological implications behind various approaches to acting, and suggests ways that behavior on the screen can be linked to the presentation of self in society. Naremore's discussion of such figures as Lillian Gish, Marlene Dietrich, James Cagney, and Cary Grant will interest the specialist and the general reader alike, helping to establish standards and methods for future writing about performers and their craft. James Naremore is director of the film studies program at Indiana University.